In 1992, Exponent II printed an issue devoted to the Gulf War. As I looked over that issue, I was struck at how relevant those articles are today. This is one I found quite poignant. Click here for the complete article. …From the time Bush started sending American troops in the Middle East, I knew that Dan would have to go. I did not like the idea but accepted his deployment as a given: He is a career Marine and a weapons specialist. Jim had been out of the Marines for several months and was living in Arizona with his wife and daughter; I wouldn’t have to worry about him. Jon Paul was stationed in Germany, working in communications with the MPs; so I felt he was safe, too. On November 11, the whole situation changed. Jon Paul called to say that he was being sent to Saudi, and I was scared. As more and more troops were sent in and the rumblings of war grew louder, the UN chose an ominous deadline for Iraq’s withdrawal—January 15, Jon Paul’s twenty-third birthday. I somehow muddled through the holidays; no Christmas spirit prevailed in our house, just a heavy feeling of impending doom. AS the 15th drew near, I struggled with my fears, fears that Jon Paul would never get past his birthday. We talked several times as we was installing phones in bunkers and needed to test the lines. He laughed and teased me but let me know that he, too, was concerned. He said that he had two prayers: One was that he would come home safely, and the second was that he would not have to fire his weapon at anyone. The 15th passed quietly, but tension mounted as I waited for the proverbial other shoe to drop. The evening of January 16 brought the news that the war was raging. The phone rang: It was Jim calling to say that he was going to re-enlist; he felt that he could not sit back while his two brothers were putting their lives on the line. I spent the night in front of the TV, crying and praying. Never had I felt so alone. Over the next few days, I lived with nightmares, afraid to watch TV, but also afraid not to. When I slept, it was with the lights on. The phone rang constantly, friends from across the country wanting to know if we had heard from the boys and to let us know that they cared. The war wasn’t even mentioned in the opening prayer of our sacrament meeting on Sunday, and when the high councilor spoke about how hard it is to have your children go off to college or on a mission, I had to leave the chapel. I felt that “alone” feeling all over again. AS the ward progressed, however, I found a wonderful network of support. 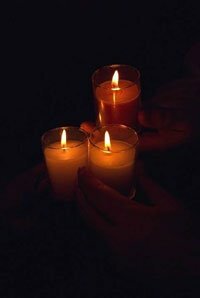 There was a group of eight Quaker men and women who stood out on a corner in Newton, a town near where I work, every evening with their candles lit in prayer for peace. It did not matter what the weather was; their only concession was to change from candles to flashlights if it were raining. Several times, I stopped and talked with them; these eight caring people prayed for my sons while they stood out in the sleet, rain, and snow. There were the staff and students at the school where I work—yellow ribbons abounded and notes and calls reminded me how much they cared. There was my family who surrounded me with love. …One of the worst times for me came when the eleven young Marines were killed near Khafji by “friendly fire.” The uncertainty was horrible. About 3:30 A.M. the following morning, I stood in front of the TV as a CNN newscaster read off the names, finished with “…and Daniel Walker,” my oldest son’s name. I thought my heart would stop. I managed to yell for Tom,. And then the newscast cut to Dan’s mother. The young Marine was Daniel B., not Daniel G. I felt as though a scud had landed in my back yard; this was much too close. AS the day went on, many people called to see if I was O.K., to see how I was feeling. There was no sense of relief; I was glad it wasn’t my Dan, but my heart ached for the other mother. On the Wednesday before the ground war started, I got a call from Jon Paul. “Mom, they said I need to make final arrangements, I don’t want to be in Arlington or Massachusetts; will you take me home to Idaho? I want to be buried by Pop.” Stark reality. Later that evening, Jim called. He had received a telegram telling him to report the next day to Camp Lejuene. All three boys were now involved. The ground war moved swiftly and, in just three days, was declared a success. For several weeks, we heard nothing from any of them. Then one by one the calls came; they were all O.K. Jon Paul said his prayers had been answered; he was dirty and tired but didn’t get a scratch. Much more importantly, he had not had to aim his weapon at anyone. What a contrast to Dan who told of no longer seeing enemy targets but of seeing the faces of those that were his targets. Looking back over the past few months, I see that many changes that this war has brought into our lives. Jim and his wife Crissy have separated over his decision to re-enlist. Dan says that he feels much older than his twenty-seven years. I have some real resentment over a bishop, a home teacher, almost an entire ward that did not care enough to even call. I have put walls up with Tom’s family. But I have rediscovered old friends, developed new friendships, and realized how very precious my children are to me. I get a bit impatient with people who keep telling met hat the war is over, that I need to put it behind me and get on with my life. Yes, Dan and Jim are home…for that I am extremely grateful, but…Jon Paul, haven’t you heard that the war is over…it is time to come home. I’m leaving the light on for you. Beautiful words. I cannot imagine the fear a mother feels seeing her child go off to war. It would be unbearable. My dear friend’s husband just said goodbye to her and their three very young children to serve in the most dangerous area of Iraq. He has been in the army reserves, working in communications, but now he is learning combat moves and interrogation techniques. My hometeacher has already had three tours of duty in Iraq…and he’s a lawyer! War is painful and scary on both sides. My heart goes out to any readers who have family in the Gulf region. My name is Jon Paul Walker and my mother was an amazing women, she died the day before Thanksgiving in 1996, while I was deployed to Panama as part of a Joint Task Force. She lost the battle to breast cancer and I miss her very much even today. I greatly appreciate the the nice things people say about her writing. She was a dedicated and charitable person putting others first even in her job choice (she worked at the Perkins School for the Blind). Thanks again for the nice comments.